There’s a losing battle going on this time of year. It’s between the humans and the leaves. Every day the rakes and leaf-blowers come out, trying to wrangle up all the maple and oak and aspen leaves into neat little piles, attempting to clean up the “mess” made by fall. But hours later a fresh spattering of leaves descends from the trees and it starts all over again. What a waste of time. I say just leave the leaves alone! I love the crunch of crisp leaves underfoot, the colorful patches they make, the scent when the rain hits them and the stains they leave behind on the sidewalk. There are much better things to do this time of year than pick up leaves. For starters, you could be baking. It’s dark out, it’s chilly, and it’s the perfect time to turn on the oven and make warm, spice-laden treats. 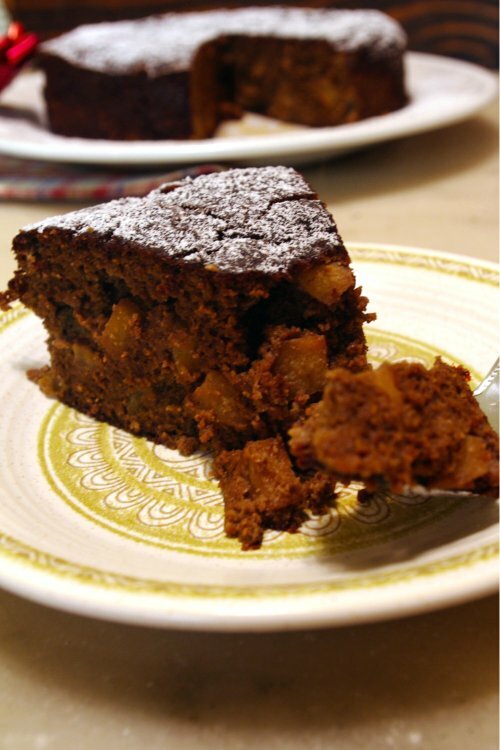 Like this Apple Gingerbread, for instance. I whipped this up last night after devouring a bowl of hot, hearty chili and indulged in a warm slice while watching reruns of Gossip Girl. Cold fall nights are perfect for guilty pleasures. Luckily, you don’t have to feel too guilty eating this gingerbread. It has all that warm, spicy comfort without being an enormous sugar bomb. I dare say this would even make a suitable breakfast. 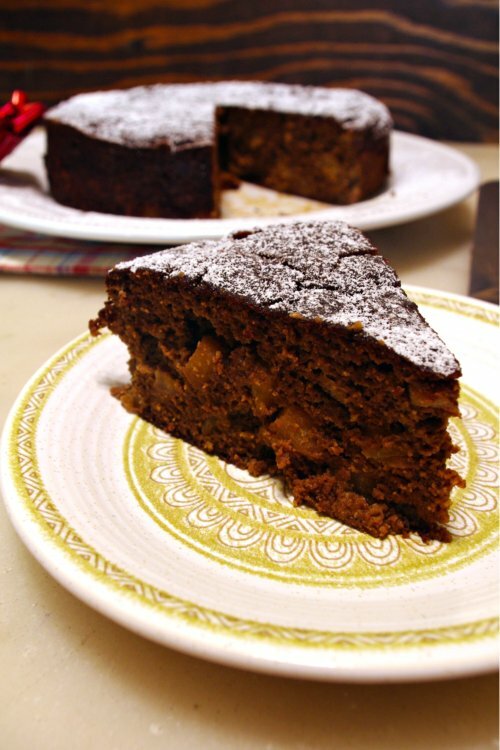 I plan on baking this gingerbread several more times this fall, maybe swapping out the apples for pears next time, or adding a couple handfuls of chopped pecans. Perhaps even some orange zest? Or bake the batter as muffins, or fill a loaf pan and use thick slices for French toast (uh oh, I’m getting crazy). Preheat the oven to 350°F. Line an 8-inch cake pan or loaf pan with parchment paper and grease well. In a large mixing bowl, sift the almond flour, coconut flour, spices, baking soda and salt. Whisk to combine. Add the eggs, melted butter, molasses, mashed banana and hot water. Whisk well until smooth. Stir in the diced apple. Pour the batter into the prepared pan. Bake until set and a toothpick inserted in the center comes out mostly clean, with just a few tiny crumbs, about 35-40 minutes (if making muffins, check around the 15-20 minute mark). Let cool in the pan at least ten minutes. Run a knife around the edge of the pan to loosen. Place your hand on top of the cake and tip upside down, set a plate on the bottom then gently flip over. Dust with powdered sugar, if desired. Serve as is or with a dollop of whipped cream. Enjoy! Reblogged this on Healthy Glow Nutrition. Um this looks fabulous and using it for French toast?? Sounds A-MAZING. this is going to my “gotta try this” list. thanks for sharing! 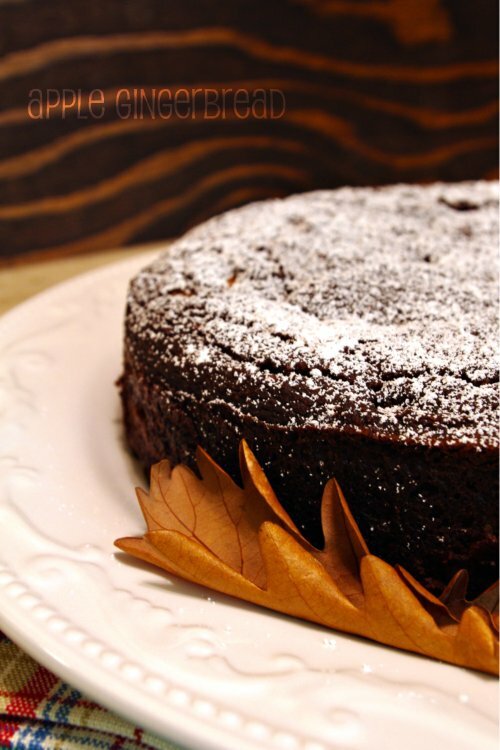 This looks absolutely fantastic and would go great with a little dollop of whipped cream! I cant decide if I really like this because it looks like a gorgeous cake or the fact its such a healthy version. This looks delicious!! can’t wait to TRY and create this!! I love this recipe and can’t wait to try it. Thank you. I will let you know how I get on. Actually, I’m English and wonder if almond flour/ meal is the same as ground almonds. I don’t have coconut flour. Can I use rice flour or soya flour instead. Can I replace molasses with black treacle? Sorry, I seem to be completely changing the recipe. Just need to anglicise it just a little! No worries! Yes almond flour is the same as ground almonds like you would use for a bakewell tart or the like. As for the coconut flour, it’s more absorbent than other flours do I would try replacing it with about 1 1/4 cups tapioca or rice flour. You could definitely replace the molasses with dark treacle or even golden syrup, you’ll just get a somewhat different flavor. Let me know how it turns out! Thanks. Will try soon and get back to you. This one looks really delicous! love that it’s grain-free! awesome recipe!